In the high-fashion world of the mid-'80s, Ashleigh McDowell falls victim to a painful betrayal by Danielle Norman, a naive and vulnerable young buyer who is fighting to save her plummeting career. How high a price will both women pay in their battle over a grave secret? Each step Ashleigh takes to uncover the truth about Danielle's actions--and her whereabouts--unwittingly exposes her to a criminal mastermind who feels events spinning out of his control. Unexpectedly, Ashleigh discovers an ally in her hunt for Danielle--the handsome Conrad Taylor. But is he the man who will steal her heart or break it? In a race against both time and the emotions that haunt her, Ashleigh ultimately finds what fate holds for her. 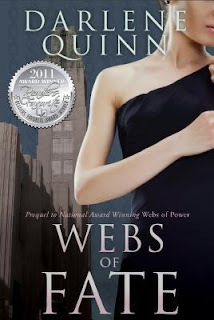 From international award-winning author Darlene Quinn, Webs of Fate is a tension-filled work of fiction that creates the background for the personalities and motivations that drive the stories in Webs of Power and Twisted Webs. This is the best so far in this series. Going back in time to visit Ashleigh and experience some of the events that are briefly mentioned and referenced in the first two books. There are three distinct crimes that happen in this book, and each has its own unique and special twist. They all revolve around a missing buyer from Bentleys Royale, Danielle. Ashleigh and Danielle have quite the history together, and she just knows that Danielle would never just disappear - she loved her job too much and would never risk doing anything to lose it. There were a few slow spots in the book that kept it from getting a full 5 star rating. These spots delved more into the retail personnel that really didn't seem to play a part in the story - perhaps they have more to do in future stories. The suspense was incredible. There were times I thought for sure that someone wasn't going to be saved, they weren't going to find the bad guys, and it would all just fall apart. But then something would happen or be discovered and the chase was on again. I loved it! Getting to know Conrad, Ashleigh, Vivian, and Mitchell in a different light was very entertaining as well - especially since I had read the books and knew where they were all going to end up. I'm enjoying this series more and more with each book.